Quick disconnect noise kits provide extra comfort and/or noise protection for users wearing surveillance accessories. Lightweight, translucent tube attaches to Motorola surveillance accessories to provide flexibility and comfort. The quick disconnect qdapter allows users, especially those in multiple shift operations, to easily remove or alternate acoustic tubes. Clothing clip prevents accessory from being pulled from the ear due to body movement or head rotation. 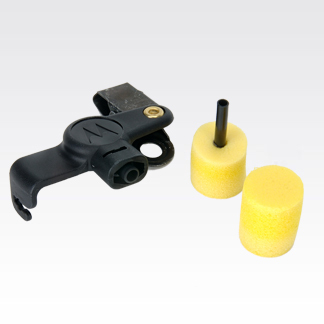 This black extreme noise kit includes 2 foam earplugs for high-noise environments and can be used with clear comfortable earpieces, Noise reduction = 24dB. For optimal performance, extra loud earphones are recommended.